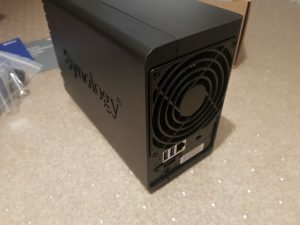 Synology finally released a new CPU refresh for their Intel CPU line, previously they have used the Intel Atom C2538 which has the dreaded Intel C2000 design fault unless you got the C0 stepping (Not available with Synology yet.). All B0 stepping CPU are effected but any DiskStation manufacture beyond February 2017 has the resistor fix. 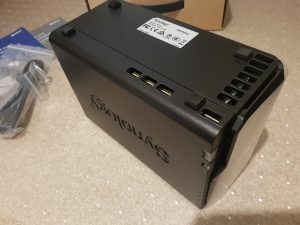 Here comes the Synology DS218+ recently released with the new Intel Celeron J3355, this CPU has only 2 cores compared to the higher tier Intel Celeron J3455 that has 4 cores but it is used in the DS718+ and the DS918+. 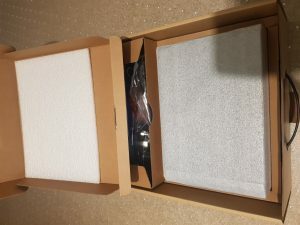 Just going to run through unboxing pictures for anyone that is keen on seeing what you get. Going to bundle this with Western Digital Blue 500GB and 640GB that I have available right now. Underneath has additional vents, there is also 6 pins that are accessible. Not sure what they are intended for…. 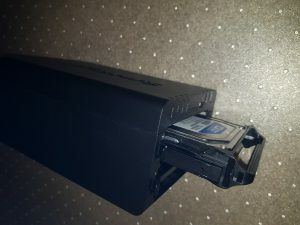 Screw-less HDD trays for Desktop 3.5″ HDD, there are four mounts point for Laptop 2.5″ HDD at the bottom. 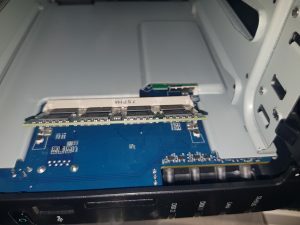 Easy accessible SO-DIMM slot to upgrade the RAM capacity of your DiskStation. Insert the RAM at a angle then proceed in pushing it down to click into place. You may notice that the first SO-DIMM is blocked which has the default 2GB RAM configuration. I will add another post on how to remove/upgrade the first slot in the future. Slide the trays back into the slot, make sure you fully push the trays into the device. 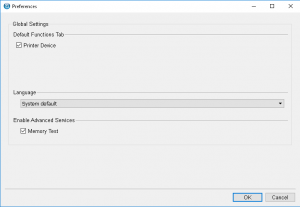 To enable memory test you must enable this through the settings (Cog icon), just tick Memory Test. Proceed in installing the DSM software onto your DiskStation, otherwise you can’t run the memory test. Once you are up and running, right click to do a memory test it will ask for your Admin password before you can proceed. There is no confirmation popup to tell you if it’s complete, if it’s beeps it has completed the test and reboot your system back online. 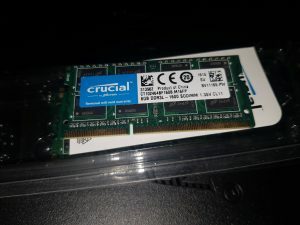 Do you think it’s possible to change the internal memory from 2 to 16Gb by adding tw 8Gb modules (Crucial CT102464BF160B 8GB DDR3L – 1600 SODIMM 1.35V CL11). I already know i have to disassemble the DS218+ to get this done. 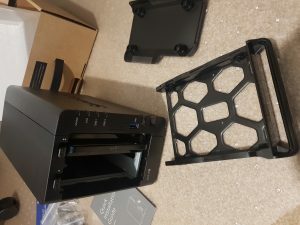 Hi, thank you for sharing your experience of a brand new NAS. 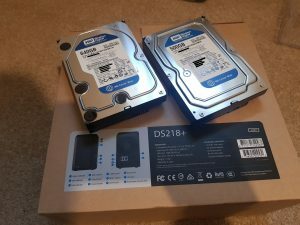 Is DS218+ working normally on 2GB+8GB RAM? I am waiting for your further posting about upgrading RAM of this NAS. Does anyone know if you can upgrade the RAM in a DS218J ??? Sorry the DS218J doesn’t have any slots. 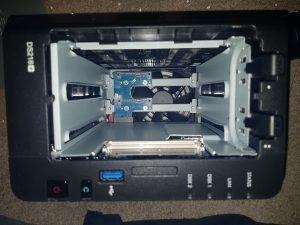 Is it possible to upgrade the processor in this unit? Nope the CPU cannot be replaced, ensure you pick the right model for your needs. Hi! If I want to expand the memory by only 4 gb, is this memory appropriate for the device? I don’t see why not, though try and make sure to buy from a place with a good refund policy. Thanks very much for your blogs (this and replace 1st SO-DIMM). I’ve upgraded successfully my new DS218+ with 2x 8GB (Crucial CT102464BF160B 8GB DDR3L – 1600 SODIMM 1.35V CL11). Do you get to use the 10gb? The official upgrade is 2+4gb and you are the only the only website who talk about using 8gb instead of 4gb in the extension bay without touching the main bay. Hi, 2GB + 8GB worked fine, booted up fine and I did a full memory test. Ensure that you get the same model, you be fine. Can you recall how long your memory test ran? 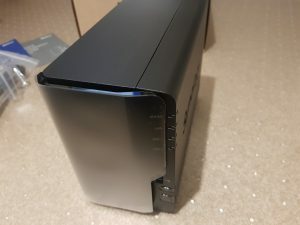 My NAS works normal but recently starts to hang every time when it runs a backup to another Synology box. When it hung, the box has to manually power down and power up. Synology support is out of idea what is going on after submitting log files and suggested I run a memory test. But warned me the memory test will run hours. I need to find out how long the test will run before I can schedule this last ditch test. Thanks for the guide. I added Crucial CT8G3S186DM 8 GB (DDR3L, 1866 MT/s, PC3-14900, SODIMM, 204-Pin) memory to my DS218+ and did 4 memtests – all passed successfuly. With the 10 GB in total, everything runs smoothly. Hi, why are you mixing the 2 GB default memory with 1866 MHz with another DIMM which has only 1600 MHz? 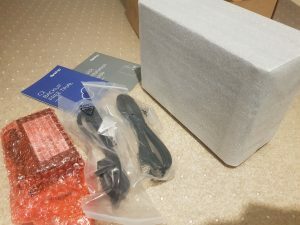 Hi Dary, I’ve already have a pair of 1600MHz RAM that I’ve used from my RS815+ which at the time was compatible on Synology website. Every RAM got a timing table to enable mix and match RAM modules, this mix and match was a temporary solution. The default RAM can lower the timing to 1866MHz to 1600MHz anyway, was planning to changed the default 2GB to a matching pair at a later date. The price of buying PC3-14900 1866MHz to PC3-12800 1600MHz, is not worth the extra money for. 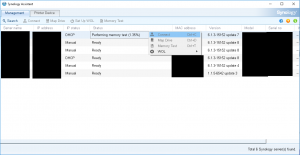 Check out my post on replacing the default 2GB RAM there are some benchmark result. Hi, hoping you can help? I’ve just added the Crucial CT102464BF160B 8GB DDR3L – 1600 SODIMM 1.35V CL11 to the free slot on my DS218+ but the system is still only showing 2GB. All boots up and works fine just not seeing the memory. Did I miss a step? Btw I also ran a memory test via the Synology Assistant and everything passed. Thanks, a 3rd reseat done the job. Not too sure why it wasn’t fitted correctly the first couple of times as it looked good. The system now sees the full 10GB. Hi! 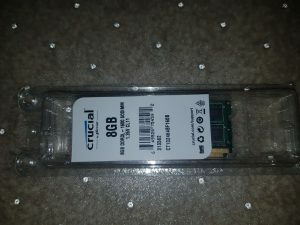 What would you recommend, one stick 8Gb or two sticks at 4gb of ram each? Hi John best to get one stick of 8GB, disassembling the whole unit for 4GB isn’t worth it. Mis-match RAMs like the 8GB + 2GB should work, dual channel would gives you a better performance but to day to day usage isn’t noticeable. as the cpu handles two ram channels, for me so the best is to put twice the same ram capacity to get the best performance (doubling ram BW). Did someone tried those ? Sure if the cpu may support it, still the chipset and motherboard must do too, so onlyDDR3L in the DS218+. Anyway if latency difference self explains (your CL11 against my CL13), max bandwidth and mem copy are disapointing (-16%…?). So maybe there is something to configure better ram access, but is seems it confirms that the less expensive 1600MHz will be the best compromise for upgrade. after testing the 2x4GB 1866MHz MEMMWY0061, I was able to test the 2x4GB 1600MHz ref M471B5173QH0-YK0. Conclusion, the 1866MHz is indeed slightly faster (but not in the frequency ratio, due to longer access time (135ns vs 130ns). Thank you FXsan for doing those benchmark, there isn’t much performance gain from this system once you get dual channel. Hence why for anyone reading this you should save your money, the 1%-2% performance boost between the 1600MHz CL11 and 1866MHz CL13 is not going to slow your system down. You should get higher rated RAM if they are the same price or cheaper, or you are planning to re-use the RAMs for another system that can utilise the extra speed. People shouldn’t stress out which speed to get either the 1600MHz and 1866MHz, while the default RAMs are rated 1866MHz CL13 they can reduce speed to 1600MHz when mixing two different RAM. Just make sure that you get matching RAM to get the most out of your Dual-Channel performance. As of Jan 2019, Amazon has the 1866 MHZ 8GB SODIMM for less than $3 more than the 1600 MHZ version so no need to downgrade the speed with this upgrade. This will probably also eliminate the need to disassemble to install and second 8GB module as I assume the performance improvement is minimal (but I would like to see the difference if anyone can benchmark). DS218+ with 1600MHz vs DS918+ with 1866MHz look at Memory Copy, Memory Latency and Memory Bandwidth, not much speed gain. Hence why people shouldn’t really worry about faster RAMs only if the RAM is cheaper or you need every single drop of performance.